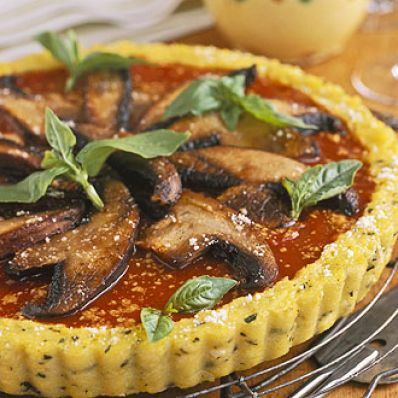 Polenta, seasoned with fresh basil and garlic, serves as the crust in this elegant make-ahead appetizer tart. Make and chill the polenta up to one day ahead. Just before baking, top with portobello mushrooms, tomato sauce, and Parmesan cheese. 2 of 4 Heat oven to 350 degrees F. Saute mushrooms in oil in large skillet over medium-high heat 5 minutes. 3 of 4 Top polenta with sauce, mushrooms, remaining Parmesan. 4 of 4 Bake in 350 degree F oven 15 minutes. Makes 8 servings.